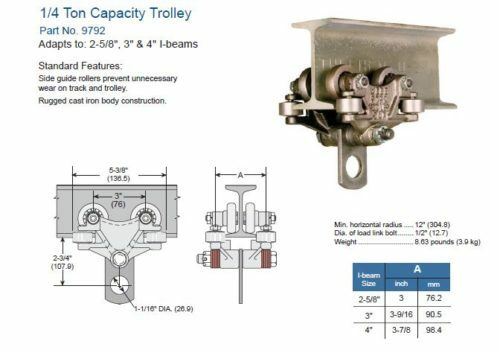 What is an I Beam Trolley? Beam trolleys are one of the earliest conveyor types. They are simple to plan, install and use. Use them as one of the most affordable ways to move products efficiently. Because of this versatility, I-beam trolley applications include home workshop use, paint finishing lines and use in automotive assembly plants. 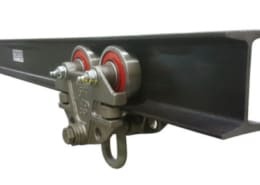 They are sometimes called monorail trolley track systems in factories. 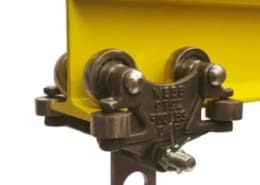 Ultimation distributes Webb’s range of hand push trolleys for steel I beams, with trolleys available with weight capacities of 500, 1,5000, 2,000 and 4,000 pounds. So unlike welded mild steel “home handyman” style trolleys, these cast iron units are designed for continuous operation in heavy duty industrial applications. They are commonly used in finishing, painting or powder coating conveyor applications as they can withstand high temperatures. To use the conveyor as a working surface. 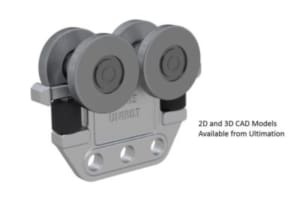 Because side guide rollers are standard on all products, they will roll more smoothly and can negotiate curves (unlike home handyman style beam trolleys). In addition, other standard features are extended flanges, standard triple labyrinth seals, and a rugged cast iron body construction. Wheels are bolted for easy replacement. 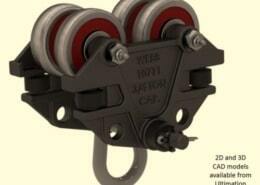 What kind of steel beam is an I beam trolley designed for? 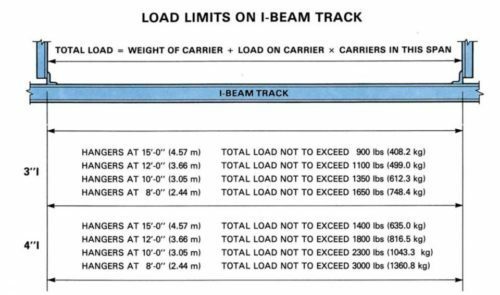 I-beam trolley conveyor components are designed to run on I beam track with tapered flanges (please see cross section in the graphic). Consequently these are known as “Standard I Beams” and generally have the prefix S (e.g. S6 or S-6 for a 6″ American Standard I beam). 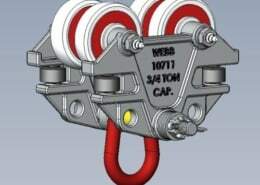 While Wide Flange or H beams have a wider flange and generally have the prefix WF (e.g. WF6). Therefore this wider flange may impact the fit of the product. See dimension “A” in the graphic and if using a wide flange or H style beam ensure this dimension is maintained. Since you should check this dimension, here is a link to the dimensions for standard S type I-beams. 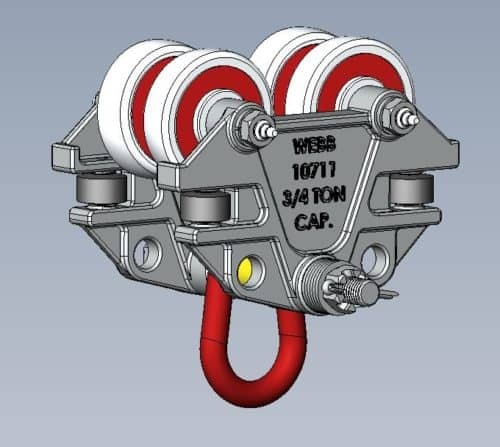 How do I make my I-beam trolley suit a wider flange beam? If the I-beam trolley you ordered doesn’t fit your beam, you are welcome to return it to us and purchase a larger model. 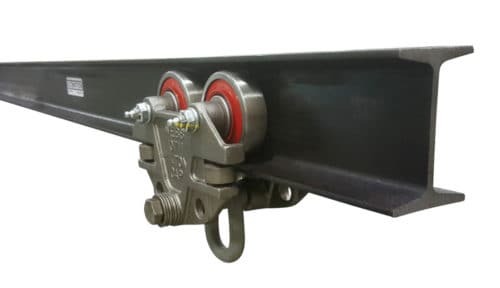 Alternatively, you can use spacers (washers or steel tube) and longer bolts as required to separate the two halves of your I-beam trolley. 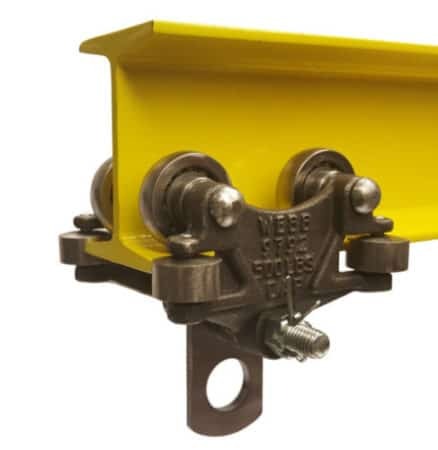 Just remember to use Grade 5 or better bolts and that when you extend the I beam trolly halves wider than their originally designed maximum spacing, you will need to de-rate the maximum loading accordingly. 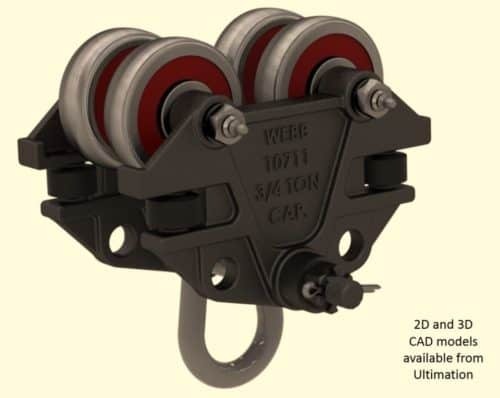 Contact Ultimation for downloadable 2D Autocad and 3D Solidworks and Inventor files of these Jervis Webb trolleys and other conveyor system components. Files are available in .dwg .step and .iges formats. Click here to request the items that you need. Call us. Our staff are ready to help.